The HTC One M8 for Windows Phone is here, and it's what everyone has been waiting for! Just kidding. Well, perhaps some of you were eagerly awaiting this device, but this one's only for the US right now. In a nutshell, it's an HTC One M8 with Android stripped out and Windows Phone 8.1.1 stuffed in, just as its name suggests. If you're already familiar with the HTC One M8, this will look and feel completely familiar to you. The body is completely identical, as are all the parts inside and out: 5-inch 1080p display, 4MP UltraPixel dual-camera setup, 2.3GHz Snapdragon 801, Adreno 330 GPU and 2,600 mAh non-removable battery. While the phone is running Windows Phone 8.1.1, HTC and Microsoft made a few tweaks so that some UI elements remain the same, or at least very similar, between both devices. The dual-camera with UFocus, for example, works with Windows Phone 8.1.1 on the new M8. Blinkfeed is on the Windows Phone version, too, but as a separate app rather than an integrated part of the UI. The camera UI looks very similar, too. There are some features that are missing due to differences in the platform, but HTC tried to keep many elements the same, like the menu settings. You'll also have access to the Duo camera, as mentioned before, which took a little work with Microsoft to get WP8.1 to support it. The phone will only come as a 32GB model from Verizon Wireless in the US. There's no word on if or when other carriers will have the HTC One M8 for Windows Phone. 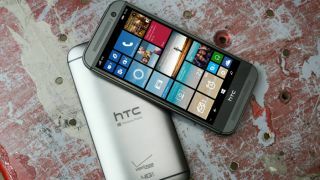 Update: And just like that, AT&T piped up that it will eventually carrying the new HTC One M8 for Windows Phone. All Big Blue would say is the phone is "coming soon" on a sign-up page, but that's better than nothing. Speaking at a press conference for the device, HTC America President Jason Mackenzie said the company had "nothing to announce" regarding global availability. Meanwhile a spokesperson for HTC told TechRadar that this would be a US-only device for now. It goes on sale Wednesday, August 20 for a promotional price of $99.99 with a two-year contract. If we had to guess, when the promotional period is over, it will go for $199.99 like most other flagship smartphones in the US. It's interesting to see HTC going through the trouble of creating a device for a platform with such small market share. But for Windows Phone fans, this is great news because the only other viable option out there is Nokia. Having a little variety is always good.